A short biography of Italian anarchist and anti-fascist militant Armando Borghi. Born Castel Bolognese, Italy, 7 April 1882, died Italy, 21 April 1968. The anarchist movement has always had its share of driving forces and tireless propagandists. Italy, ever since the days of the First International, has produced a number of exceptional agitators - Carlo Cafiero and Andrea Costa, back at the beginning; Luigi Galleani and Pietro Gori at the turn of the century; Errico Malatesta, Luigi Fabbri and Camillo Berneri and Armando Borghi in more recent times. With the death of Borghi in 1968, the Italian movement lost one of its finest representatives. Over a 60-year period, Borghi forged relentlessly ahead with his activities with a truly outstanding belief and enthusiasm. He died at the age of 86. Born in Castel Bolognese in the Romagna on 7 April 1882, he embarked upon his activities as an anarchist militant at the age of 16. In his major work A Half-Century of Anarchy he describes with his subtle and sparkling style the ups and downs of his frantic life as an activist and propagandist. He relates how, in 1898, when he was barely 16 years old, and unbeknownst to his parents, he travelled to Ancona to attend the trial of Malatesta on the charges of justifying criminality and plotting against the State that arose from his having published the weekly L'Agitazione in Ancona. It was at this point that Borghi had his chance to view Errico Malatesta in the flesh (as he used to say) in the dock. He conceived a lifelong fondness for Malatesta. From then on, Borghi was up to his neck in activity and in the struggle. In 1900 he settled in Bologna and there, following the assassination of King Umberto I by Gaetano Bresci (on 29 July 1900) he unreservedly endorsed the heroic act, in contrast to those socialists, republicans and a small clique of Rome-based anarchists who had condemned the killing. His first arrest came in Bologna in 1902, over anti-militarist propaganda. In April 1903, he won his spurs as a public speaker, again in Bologna, when he was chosen by the anarchists to address a huge rally called to protest at military expenditure. The young anarchist, then just 20, made his mark. He was welcomed to the rostrum by Andrea Costa. It was his very first success as a public speaker. He became the official spokesman of the anarchists at all rallies. A flurry of innumerable arrests and trials followed. His defence counsel at all times was Pietro Gori who always showed up for his trials. 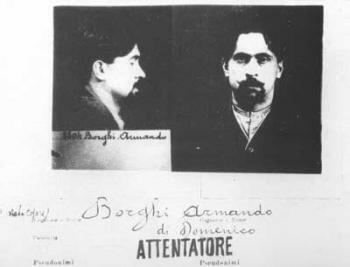 Armando Borghi was arrested during a demonstration in 1904 and spent several months in the San Giovanni in Monte prison. In 1905, he was sentenced again in Ravenna to a five month prison term for "incitement to crime". Between 1903 and 1906, he spent longer behind bars than as a free man. In May 1906 he had barely come out of prison when he was commissioned in Ravenna as editor of L'Aurora, an anarchist weekly, taking over from Domenico Zavaterro. It was from the columns of L'Aurora that he severely upbraided anarchist individualism. It was from the same platform on 9 July 1906 that Borghi marked Gaetano Bresci's assassination. He was indicted over this vibrant article which earned the author as well as the managing editor a year behind bars. Borghi saw imprisonment again in Ravenna and then in Piacenza. He was freed early in July 1907. It was at this point that he agreed to take up a post as trade union agitator. He was invited to join the secretariat of the Bologna and District Construction Union. However, he was not converted either to trade unionism or to anarcho-syndicalism but remained comprehensively and full-bloodedly anarchist. But he found it useful to mix with the workers in order to fight for their emancipation. The Bologna Construction Union was not affiliated to the CGL (General Confederation of Labour), but belonged, as did many another organisation, to the National Direct Action Committee. Borghi stayed in Bologna as secretary of the Construction Union for over three years and, along with Giuseppe Sartini, represented the old Chamber of Labour which was independent of the CGL. But even then he did not neglect anarchist propaganda. When, on 13 October 1911, trooper Augusto Masetti fired a gunshot in the parade ground of the Cialdini barracks in Bologna at his colonel by way of a protest at the war in Libya while shouting out 'Down with the war! Long live Anarchy! ', Armando Borghi and Maria Rygier immediately composed a special edition of L'Agitatore welcoming the action of the rebel soldier. Borghi's article was entitled "Anarchist revolts shines through the violence of war". The newspaper was impounded and a round-up of anarchists began. Maria Rygier was the first to be arrested. Borghi got away by the skin of his teeth and fled to Paris. He stayed abroad until the end of December 1912, involving himself in active anti-militarist propaganda, giving lectures in France and Switzerland. After the Italian government offered an amnesty to mark the conclusion of a peace treaty with Turkey, he returned to Italy. In the autumn of 1912, the Italian Syndicalist Union (USI) had been launched in Italy. It ought to be noted that Borghi, in exile in France at the time, had no hand in the launching of the USI but affiliated to it in his capacity as organiser for the labour unions independent of the CGL. Which brings us to the "Red Week". A national campaign committee had promised protest rallies all across Italy in protest against militarism, the disciplinary battalions and to press for the release of Augusto Masetti. These were scheduled for the first Sunday in June. Following a rally in Ancona - addressed by Malatesta - there were clashes between the crowd and the police and three young demonstrators were killed. A general strike was called in all of the big cities in Italy. In the Marches and in the Romagna region, the strike took the form of out and out insurrection. Betrayal by the leaders of the CGL prevented the revolutionary uprising from scoring the success it deserved. The government backlash soon gained the upper hand. Malatesta managed to evade arrest and fled to London. On 7 June Borghi was speaking in Florence. The moment he heard of the deaths of the three young people in Ancona he made for the Romagna to do his bit in the uprising. To his great surprise, on this occasion he was not arrested. In August 1914, the Great War erupted. In keeping with his basic anarchist principles, Borghi immediately declared his opposition to the war. De Ambris, Corridoni and Masotti and other USI leaders hoped to 'convert' the USI-affiliated unions to the interventionist cause. They called a general congress of the USI in Parma in September 1914. Borghi steadfastly argued the need for the USI to come out against the war. The USI branches endorsed Borghi's resolution by an overwhelming majority. Borghi took up the secretaryship of the Italian Syndicalist Union. The USI relocated its headquarters to Bologna and thereafter Armando Borghi's time was entirely consumed by anti-war propaganda. But not for long - because after May 1915 - when Italy entered the war - he was interned in Impruneta, a small town near Florence and later in Isernia in the Abruzzi. When the war ended in November 1918, Borghi resumed his activities as USI secretary and director of the weekly Guerra di Classe. Ever by his side as a priceless collaborator and beloved spouse was Virgilia D'Andrea. Very active during the cost of living campaigns in July 1919, Borghi was an active, zealous agitator, not merely in his trade union organiser capacity but also, indeed primarily, as a fervent anarchist. In late December 1919, Errico Malatesta returned to Italy and in Milan he ran the daily newspaper Umanita Nova. Borghi and Malatesta were on the same wavelength and their respective propaganda drives brought the Italian people to crucial revolutionary accomplishments such as the factory occupations in August-September 1920. Armando Borghi was not in Italy at that time. In May 1920, he had left for Russia at the invitation of the Bolshevik leadership, keen to talk with a representative of the USI and, if at all possible, with its secretary. It was a particularly adventuous trip, as detailed in A Half-Century of Anarchy. In Moscow Borghi had an audience in the Kremlin with Lenin. Lenin asked him if he were opposed to centralism and Borghi replied: "You have that right. How could any anarchist be in favour of centralism?" To which Lenin retorted: "Freedom ought not to be the death of the revolution." Borghi countered with: "In the absence of freedom, the revolution would be a horror." Their conversation proceeded quietly. Learning of the factory occupations back home, Borghi scurried homewards. This second journey brought him to Milan by 20 September, by which time the reformist trade union organisations had ordered the factories to back down on 17 September. There was nothing that he could do by then, but he declined an invitation from the government that he join, as representative of the USI, a commission drafting a law on workers' control. Meanwhile, the government was cracking down heavily again. In October, Borghi, Malatesta and other anarchists were rounded up on no particular charges. In the San Villore prison in Milan, on 14 March 1921, Malatesta, Borghi and Quaglino launched a hunger strike to force the court authorities to set a trial date. After nine months in prison on remand, by late July 1921, they were brought for trial to the Assizes in Milan. All of those charged were freed. Malatesta and Borghi had offered a zealous defence of themselves. Fascism was now in the ascendant and the lives of antifascist militants were in the balance. Borghi and Virgilia D'Andrea were continually receiving death threats. Armando Borghi fought against the fascists by promoting the "Labour Alliance" in an attempt to erect an obstacle in the path of the fascist victory. But after the March on Rome in October 1922, all attempts to fight fascism were in vain. Along with Virgilia D'Andrea, Borghi had to leave Italy in 1923 and they went into exile, first in Berlin and then in Paris. In France he carried on his fight against fascism. He penned his first volume of memoirs Italy Between Two Crisis. It was published in Paris in July 1924. In October 1926, Borghi left France for the United States. He arrived to find the campaign for Sacco and Vanzetti at its height. At the invitation of their support committee, he gave many talks and appeared at meetings. But even in the States he could not escape arrest and trial and was often released only on payment of huge bail bonds. An active contributor to L'Adunata dei Refrattari he often signed his articles with a pseudonym, with the police forever on his trail. Virgilia D'Andrea was always at his side. She was an active propagandist and a fine public speaker. But on 12 May 1933 she died while still quite young. In the United States, Borghi struck up friendships with Gaetano Salvemini and Arturo Toscanini and his son, Walter. After the downfall of fascism he returned to Italy, landing in Naples in October 1945. Immediately embarking upon a frantic lecture tour. In 1946, he visited all the major cities of Italy - Rome, Bologna, Ancona, Milan, Carrara, etc. In December that year his car crashed into a lorry. He came away with serious head wounds and some broken ribs but his travelling companions emerged unscathed. He spent a long time in hospital in Ravenna, followed by a lengthy convalescence. He stayed in Italy until March 1948, involving himself in active propaganda and affording his comrades the benefit of his long experience and his thorough knowledge of the many issues confronting the anarchist movement. Then he felt the urge to return to the United States, weary from his frantic, restless lifestyle in Italy. He stayed in the USA until 1953 returning to Italy that year and he was in perfect health when he took part in the March 1953 congress of the Italian Anarchist Federation (FAI) in Civitavecchia. Once again, Armando was the centre of the Italian anarchist movement which was experiencing a promising revival. He settled in Rome, assisting Gigi Damiani and Umberto Consiglio in bringing out Umanita Nova. He stayed in Italy after that and his activities were genuinely beneficial to the movement. For twelve years up until October 1965, the presence of Armando Borghi in Umanita Nova in the shape of his lively, vivacious articles, left an indelible mark. He died on 21 April 1968.